 An engrossing history of an obscure incident: the 1823 mass uprising of slaves in the South American British colony of Demerara (present-day Guyana). Da Costa (History/Yale) draws on ample primary sources- -diaries, plantation records, letters, and records of legal proceedings, including complaints of the slaves themselves--to draw a riveting picture of the Demerara colony: Approximately 5,000 free people, half white and half black, lived among 77,000 slaves who worked the colony's 60 plantations. On August 17, 1823, 9,000- 12,000 slaves, inspired by the recent French, American, and Haitian revolutions, surrounded plantation houses throughout the colony, smashing windows, menacing masters and overseers, and seizing weapons. The uprising provoked a savage reaction from colonial authorities: In over three days of fighting, more than 255 slaves were killed, while during the few days the slaves held power only three whites were slain. 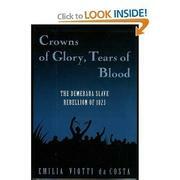 Da Costa views the crisis from multiple viewpoints (of course, accounts by whites dominate the record): Planters who defended the colony's inhumane economic system blamed English missionaries for fueling the rebellion, while the missionaries, who decried the slave system, condemned the oppressiveness of the masters. Da Costa describes the career and political trial of John Smith, a missionary who defended and identified with the slaves: Smith was condemned to death for inciting the rebellion, then died in prison while his appeal for clemency was pending. In the end, while Parliament declined to censure the Demerara authorities, the rebellion and the excesses of the planters ``gave a boost to the abolitionist movement'' and hastened the end of slavery in Demerara and elsewhere in the empire. A first-rate account of a little-known episode that had large consequences for Britain and for the world: careful, professional scholarship married to a well-told story.